Cholmeley was born in 1918. In August 1940 he served in 80 Squadron in North Africa. At this time the unit was equipped with Gloster Gladiators. At 17:00 on 8 August, Maggiore Carlo Romagnoli (CO of the 10o Gruppo) took off from El Adem T3 airfield with 15 other aircraft from the 9o and 10o Gruppi to patrol along the Egyptian border and to give indirect cover to five S.79 bombers and a single reconnaissance Ro.37, which were out to patrol the same area. 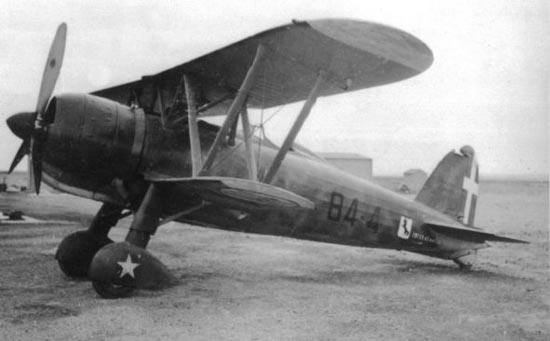 The five S.79s were a formation from the 44a Squadriglia, 35o Gruppo, led by Capitano Pagliacci, which were out to bomb enemy vehicles and aircraft in the Bir El Chreigat area. Participating pilots were: Romagnoli, Capitano Giuseppe D’Agostinis (CO 91a Squadriglia), Tenente Enzo Martissa (91a Squadriglia), Sergente Aldo Rosa (91a Squadriglia), Tenente Giovanni Guiducci (CO 90a Squadriglia), Sergente Maggiore Angelo Savini (90a Squadriglia), Capitano Luigi Monti (CO 84aSquadriglia), Tenente Vittorio Pezzè (CO 73a Squadriglia), Tenente Valerio De Campo (73a Squadriglia), Sottotenente Carlo Battaglia (73a Squadriglia), Sottotenente Alvaro Querci (73a Squadriglia), Maresciallo Norino Renzi (73a Squadriglia), Sergente Maggiore Enrico Dallari (73a Squadriglia), Sergente Maggiore Antonio Valle (73a Squadriglia), Sergente Santo Gino (73a Squadriglia) and Sergente Lido Poli (73a Squadriglia). Completely unseen by Pezzè and the other Italian pilots a third formation of Glosters attacked from above on the 73a Squadriglia formation (the surviving Italian pilots estimated that each British formation was nine planes strong so, after the combat, they assessed that they fought against twenty-seven enemy fighters for fifteen minutes). The Gloster Gladiators were from 80 Squadron (‘C’ Flight had arrived at Sidi Barrani during the day, led by the commanding officer, Squadron Leader ‘Paddy’ Dunn). Late in the afternoon 14 Gladiators from the Squadron flew an offensive patrol in the neighbourhood of El Gobi since it had been reported by observers that large formations of CR.42s had been patrolling a triangle between El Adem, Sidi Omar and El Gobi fairly regularly twice a day. It was planned to lure the Italians into thinking there was only a small formation of Gladiators. To do this three aircraft were to act as bait. Accordingly three Gladiators (Dunn (leader), Flying Officer Peter Wykeham-Barnes and Flight Sergeant Trevor Martyn Vaughan) were to fly at 8,000 feet, with three more (Flight Lieutenant Evers-Swindell (leader), Flying Officer Wanklyn Flower and Frankie Stubbs) at 10,000 feet. Four flew at 12,000 feet (Flying Officer 'Heimar' Stuckey, Flying Officer P. T. Dowding, Pilot Officer Cholmeley and Sergeant Donald Gregory) and the final four at 14,000 feet (Flight Lieutenant 'Pat' Pattle (leader), Flying Officer Sidney Linnard, Flying Officer Harold Sykes and Flying Officer Greg Graham). All formations flew in a broad vic and it was the first time that the 80 Squadron operated at full operational strength. As leader of the highest formation, Pattle controlled the formation. Just after 18:00 the Squadron crossed the frontier south of Sidi Omar, and immediately changed course to head north towards Bir Taieb el Esem. As they were approaching Bir el Gobi a mixed formation of a reported twenty-seven CR.42s were spotted below flying in nine sections of three aircraft, the sections flying in a broad vic formation. Leading the Gladiators into the sun Pattle ordered the lower sub-formation to attack. As this formation reached the Italian fighters the other sections were ordered down. The attack was a complete surprise. In five minutes 13 of the enemies were claimed shot down with six or seven more probably destroyed. Pattle attacked one CR.42 and from about 50 yards he fired two short bursts directly into the fuselage of it. It fell into a spin and burst into flames on striking the ground. After searching for more enemy aircraft he was attacked by one. He turned around and spotted it 100 feet below and flying at right-angles to his Gladiator. With the advantage of height, he stall-turned his aircraft and came down behind the CR.42 less than 30 yards from its tail. He fired one brief burst into the cockpit and engine of the CR.42, which instantly exploded into a flaming mass of falling debris. Seeing no further signs of enemy aircraft over the area, Pattle turned towards Sidi Barrani and on his way home was joined by Graham, who claimed a probable and also witnessed Pattle’s two victories, and Linnard, who claimed two destroyed. They landed at ten minutes past seven to find that most of the others were already back. Additional victories were claimed by Dunn (who also claimed one of the probables), Stuckey (who also claimed one of the probables), Evers-Swindell and Sykes, all four pilots claiming two destroyed each, while Wykeham-Barnes claimed one destroyed. Additional probables were claimed by Dowding, Flower and Cholmeley. Flight Sergeant Vaughan (RAF No. 590381) (Gladiator K7903) was killed in this combat after being attacked by two CR.42s and Evers-Swindell was shot down after shooting down one of Vaughan’s attackers. He parachuted, and was safely picked up armoured cars of the 11th Hussars. It is possible that Flight Sergeant Sidney Richens also took part in this combat since he claimed a probable CR.42 in the El Gobi area during the day. It seems that the 73a Squadriglia suffered most from the surprise attack, losing five aircraft when Sergente Enrico Dallari and Sergente Antonio Valle baled out, Sottotenente Querci and Sergente Santo Gino force-landed and Maresciallo Norino Renzi failed to return. Sergente Lido Poli was hit early in the fight, being severely wounded in the left arm. Despite this, he continued to fight, claiming to have shot down one Gladiator before force-landing close to the T3 airfield. A patrol from the army immediately took him back to El Adem. Then he was send to the navy hospital of Tobruk where his arm was amputated. For this courageous display he was awarded the Medaglia d'Oro al Valor Militare. The official citation of his award stated that he “shared in the destruction of five enemy fighters”. It is also highly likely that his aircraft was recovered because the same citation stated that “he succeeded in landing his plane without damage”, obliged only by the loss of blood caused by his wound. The Italians totally lost eight aircraft. Additional pilots were Sergente Rosa, who was slightly wounded baled out and Tenente Martissa. In return the Italian pilots claimed seven Gladiators (three shared amongst the pilots of 10o Gruppo and two shared by the surviving 73a Squadriglia pilots) and two probables. "We saw an aircraft in the desert. We approached and found Tenente Martissa under a wing, with a leg almost torn off by an explosive bullet from a British fighter. We rescued him. He told us that if we didn't come [to save him], he'd shoot himself at the head with his gun, because he was dying of thirst. MM4308, flown by Tenente Enzo Martissa on 8 August, when it later served with the 84a Squadriglia of the 10o Gruppo. The Fiat CR.42 flown by Martissa (MM4308) was recovered and, in September 1940, assigned to the 84a Squadriglia of the 10o Gruppo as “84-4”. On 15 September, 80 Squadron flew up to the front to a location simply known as Y landing ground. The Italian targets of the day were closer to the battlefront and centred in the area of Sidi El Barrani. At around 13:00 (the sixth Italian mission of the day) ten S.79s from the 46o Gruppo, led by Maggiore Cunteri, was intercepted over Sidi Barrani by Gladiators from 112 Squadron, which were on patrol at 16,000 feet, thirty miles out to sea. The Gladiators were divided into two sub-Flights. In the first flew Flight Lieutenant Charles Fry, Flight Lieutenant R. J. Abrahams and Flying Officer Joseph Fraser. In the second flew Pilot Officer R. H. Clark, Flying Officer Edwin Banks and Pilot Officer R. J. Bennett. When the Italian bombers approached, the No. 1 sub-Flight took on the first formation of five aircraft and drove them out to sea before they could release their bombs while No. 2 sub-Flight closed on the second five after they had released their bombs. Banks and Clarke chased this formation out to sea and managed to get close enough to open fire. Both claimed damaged to one aircraft each. Banks attacked the outside aircraft but the enemy took evasive action causing his aircraft to be hit by cross fire from the bombers and he was forced to break off the action. Two Hurricanes of 274 Squadron and two Blenheims of 30 Squadron (Flight Lieutenant Frank Marlow and Pilot Officer Jarvis) got amongst the enemy formation as well. Flight Lieutenant John Lapsley (Hurricane P2544/YK-T) and Sergeant John Clarke (Hurricane P2641) each claimed one S.79 in this combat (this was Lapsley’s 6th kill of a total of 11 kills). Clarke’s Hurricane was hit and a bullet tore the mouthpiece of his flying helmet away. Jarvis and Marlow chased the S.79s for twenty-five minutes, firing all their ammunition. Jarvis damaged two, one of which may have been destroyed, while Marlow (Blenheim K7096) claimed one destroyed. Meanwhile, ten Gladiators from 80 Squadron had been on patrol on the seaward side of Sidi Barrani. Nothing was seen and the squadron split up into sections. The section lead by Pilot Officer Cholmeley came across five of the S.79s approaching from the northeast. The Gladiators attacked and forced the bombers to turn back, but return fire hit Cholmeley’s aircraft and it fell into the sea killing the pilot. One S.79s was damaged by Flight Lieutenant 'Pat' Pattle. The Italian bombers fought back with determination and claimed one Gladiator, one Hurricane and one Blenheim with a second Gladiator as a probable. Three S.79s didn’t make it back to Maraua while four other S.79s returned damaged. Two of the three bombers that didn’t returned were forced to make emergency landings at T2 (and were probably written off after landing). On the S.79 flown by Sottotenente Di Francesco there were one dead and four wounded and on the S.79 flown by Maresciallo Berghino was Maresciallo Fotografo Walter Nencini (operator of the Istituto LUCE, the propaganda service) killed and two wounded. The third S.79 flown by Capitano Masoero of 21a Squadriglia (co-pilot Sergente Maggiore Furini) crash-landed at Ponticelli airstrip with two crewmembers dead and two wounded. The wreck had suffered between 600 and 700 bullet holes. At the time of his death Cholmeley was credited with 1 probable biplane victory, this one being claimed while flying Gloster Gladiators. Biplane victories: 1 probably destroyed. (a) Claimed in combat with 9o and 10o Gruppi C.T., which lost 8 CR.42s and 1 pilot while claiming 7 and 2 probable Gladiators. 80 Squadron claimed 13 and 6 or 7 probably destroyed while losing 2 Gladiators and 1 pilot.